This salted soap is designed to be a hand soap. To use it as a body soap, lather it in your hands or on a wash cloth first because the salt makes it a bit abrasive. Because it is imbedded with extra fine pink Himalayan salt it works great to scrub dirty hands. 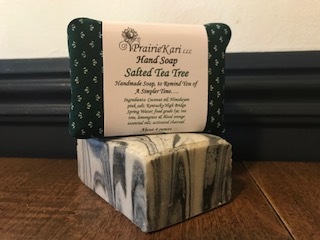 With the herbal scent of Tea Tree essential oil, paired with the bright fresh scents of lemongrass and orange essential oil, this soap is a family favorite. Ingredients: Coconut oil, Pink Himalayan salt, locally sourced Kentucky Proud Highbridge Spring water, food grade lye; tea tree, lemongrass and blood orange essential oils; food grade activated charcoal.